a&o Budapest City is situated in the centre of Hungary’s beautiful capital. It serves as the perfect starting point for day trips in the lively metropolis. The hostel has a total of 412 beds in 114 modern single, double, family, and multi-bed rooms, spread out across three stories. With modern hotel standards, different room categories, and friendly service staff, a wide range of guests will feel right at home here, from backpackers to couples, families, and groups. Comfortable, modernly furnished rooms will make your trip truly special. We offer the perfect accommodation for a trip to Budapest: with a central location and the best prices! Our a&o Budapest City lies in the middle of the vibrant neighbourhood of Erzsebetvaros. 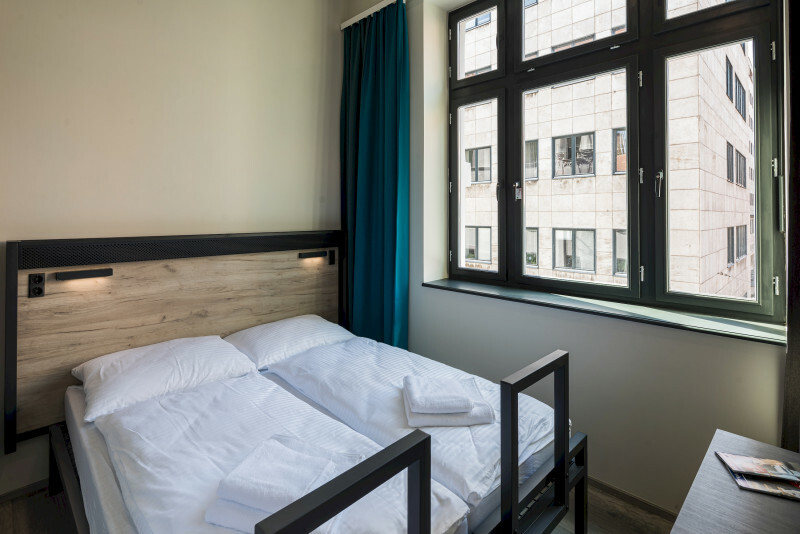 Located just 15 minutes from the central station and the Danube, the hostel will open in August 2019. With a tram and trolley bus stop a mere 2 minutes from the hostel, guests can easily reach all of the city’s sights. Additionally, the banks of the Danube, including the famous Margaret Island, are just 15 minutes away. In the evening, the nearby cafes and bars invite you to dive into the city’s nightlife. Our a&o Budapest City lies in the middle of the vibrant neighbourhood of Erzsebetvaros, located just 15 minutes from the central station and the Danube. With a tram and trolley bus stop a mere 2 minutes from the hostel, guests can easily reach all of the city’s sights. Additionally, the banks of the Danube, including the famous Margaret Island, are just 15 minutes away. In the evening, the nearby cafes and bars invite you to dive into the city’s nightlife. The Kelelti pályaudvar (Eastern Railway Station) is just a short trip away from a&o Budapest City. Take trolleybus 73 to Do utca. From there, you can comfortably walk the 300 metres to your accommodation. Take a left into the Dob Ucta street, then another left into Cengery Ucta. The hotel is located on the right-hand side. Take Bus 100E from the bus stop Liszt Ferenc Airport 2 towards Deák Ferenc tér M, for two stations and get off at Astoria M. Now, take trolleybus 74 towards Csáktornya Park at the Károly körút (Astoria M) stop and drive for four minutes until Szövetség utca. From here, you only need to walk for about five more minutes. You’ll find the a&o Budapest to your left. If you plan to arrive by car, simply click on this Link and enter your starting address. The Google Maps route planner comfortably navigates you to our a&o.